Maureen’s 30-plus year career has spanned from classroom teacher to technical trainer to corporate management consultant. Fortunate to work both nationally and internationally, with a lifelong passion for learning, she studied psychology and with her Master’s degree pursued a concentration in counseling. Maureen went on to follow a Master Meditation Teacher for 20 years; she then “discovered” horses. 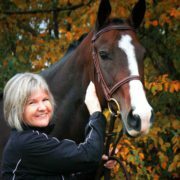 Graduating from Koelle’s 2011 Equus Coaching Program, Maureen partnered with Marlene Armstrong (Class of 2012) to launch “Unbridled Coaching”. Maureen and Marlene have had the privilege to partner in turn with the horses at Foxview Stables, whose wisdom and coherence inspire every day. As a result, clients from 15 to 80 years of age—moms and daughters and families—have connected with what they truly want in life and, with grace and compassion, have realized those dreams.